Notes: These flies were initially designed to specifically imitate adult stoneflies. Randall Kaufmann is often credited with the pattern design, however, it may be the design of Jim Slattery of West Yellowstone, MT. Jim indicates that he designed the fly around 1980 while he lived near the Musconetcong River in New Jersey. 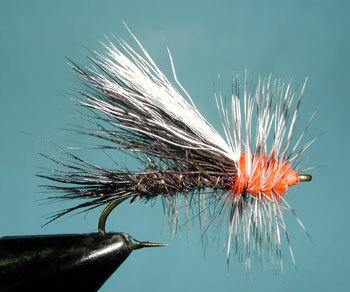 He first named it the "Fluttering Stonefly", then changed it to "Stimulator" after a New York City Punk band that was very popular at the time. His inspiration came from an earlier fly, the Sofa Pillow, designed by Pat Barnes in the 1940's, with an orange floss body, a red squirrel tail wing and a red duck quill tail. A brown hackle was wrapped in front of the wing. It was named by a group of Texans that Pat was guiding when they were amazed at the size of the fly. One remarked, "It's as big as a Sofa Pillow". The Sofa Pillow was subsequently modified by Pat Barnes to the Improved Sofa Pillow in the 1950's by going with a Deer or Elk Hair wing, Deer or Elk Hair tail, and palmering a brown saddle hackle through the body as a ribbing, which he clipped. 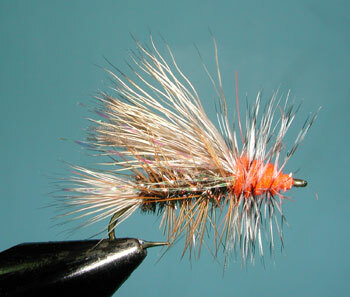 This fly is still used today for Salmon Fly, Skwala, and Golden Stone imitations. Both flies used a Brown Saddle Hackle for the thorax. Jim's design had a longer thorax where the thorax and abdomen were about equal lengths, similar to the natural. He used Deer Hair for the wing and tail. The tail hairs were stacked uniformly but the wing hairs were not, to give the wing a more fuller appearance. His first Stimulator had a golden yellow olive body and a orange thorax. The contrasting coloration were a key feature to this design. Jim used two Blue Dun Hackles palmered through the abdomen and the thorax. 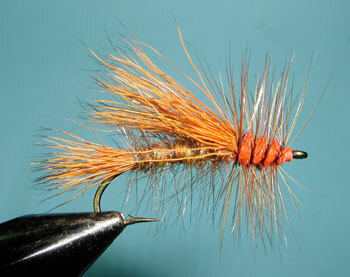 The hackle through the thorax was palmered about 2/3's through so that the head would have no hackle at all. Using a palmered hackled also allowed the thorax color to be quite visible. Jim's Stimulator came to the West Coast with a group of flyfishermen that Jim sold his flies to and reached commercial tier, Randall Kaufmann, in 1980. Randall desired to make modifications to the pattern while keeping the same name. He certainly popularized the pattern through his books and articles. Randall introduced the Yellow Stimulator pattern in 1980. His version of the Stimulator has a yellow body of Antron Yarn or Haretron and an orange thorax of Angora Goat. Randall went back to the Elk Hair as a wing and tail. He also shortened the thorax so that it would be about 1/3 of the total body length. The head was represented by thread wraps just behind the eye with the Fire Orange thread. The body hackle was ginger or badger and the thorax hackle was Grizzly. Rather than hand bending a Streamer Hook, Randall preferred to use the newly developed Tiemco 200R. 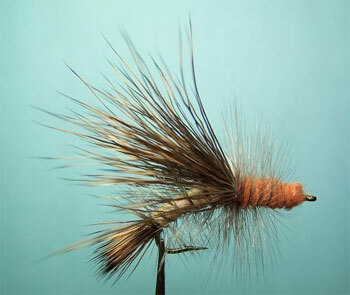 Tied in sizes 6-8 , it can imitate both the salmon fly and golden stones or, when tied in size 12-14, the Stimulator can also be used to imitate Little Yellow Stoneflies. 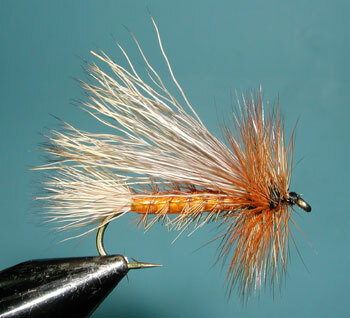 Randall would tie the pattern in smaller sizes 14-18, to represent caddisflies in tan, green, olive, brown, and gray. He'll add some calf body over the elk wing for better visilibility. The Stimulator will also makes a good hopper pattern. Kaufmann finds that the pattern is often overdressed by other tiers. He recommends a hairwing and tail that is sparse, yet flared, to achieve the appearance of bulk. This will help stabilize the fly on the water surface. The body should also be dubbed with a small diameter and palmered with a hackle that is 1-2 sizes smaller than the hook size generally calls for. 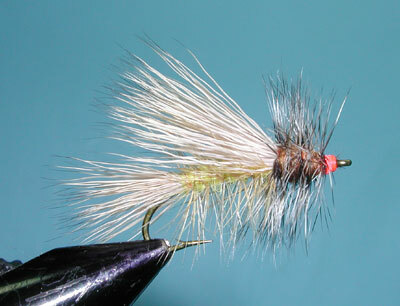 The palmered hackle should be stiff and tapered with the smaller section at the tail. Many genetic hackles will not have this type of taper, and you may need to select these hackles from a cape that offers a tapered hackle. 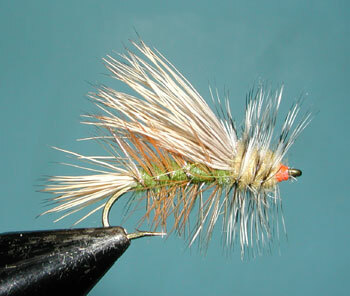 Variations of this fly introduced by Randall include the Gold Stimulator (1987), sizes 6-10, for Golden Stones; the Orange Stimulator ( 1982), sizes 4-8, for Salmonflys; the Green Stimulator (1981) tied in sizes 14-18 for the little green stones of late summer and fall; and the Black Stimulator (1988), sizes 6-18, for dark or black stoneflies. The Peacock Stimulator is excellent for Skwala Stones in sizes # 8-12 that show up in early Spring. The most prevalent stoneflies within the Sierras are the Golden Stones which hatch in May through July and the Little Yellow Stones which hatch during the Summer months. Less prevalent, but certainly important, are the Skwala and Salmonfly hatches which occur on a number of Sierran streams. These hatches are more confined as to their time limit of emergence yet can be the dominant hatch when they occur. The Skwala Stones are often mistaken for early Golden Stones and will hatch on freestone streams in the early Spring around March and April. Salmonflys, Pteronarcys californica, will hatch around Memorial Day and into June. Many of the Stoneflies will hang upon shoreline vegetation and fall into the water from wind gusts. Stimulators working the banks, particularly under overhanging foliage will do well. Stoneflies will also lay eggs over the water and sometimes flutter into the water by accident. Trout are often waiting for these periods of time. Abdomen Hackle: Brown Hackle, Palmered. 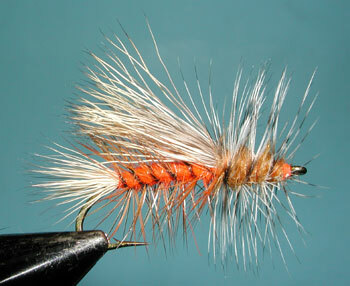 Abdomen: Burnt Orange Floss, Palmer with Brown Hackle, clipped.